Cooking with dried beans is easy and more economical than buying canned beans (which often contain salt as part of the ingredients). It just takes a little time. You can often buy a big bag of dried beans that will make double or triple the amount of cooked beans. In practice when I work with dry beans, I have found the following methods below helpful in cooking and preparing dried beans to be eaten on their own, or to be used in a final bean-based recipe. It also ensures that the beans are cooked through sufficiently. Two methods are presented below. Choose what method works for you depending on the amount of time and kitchen equipment you have. Of course, since a wide variety of different dry bean types and sizes exist, cooking times may slightly differ, but I hope these general guidelines below are helpful. Regardless of the method you choose, it is generally recommended to throw out the first batch of cooking water that you use when boiling the beans, and then you can save the second batch of cooking water for later use in cooking if you desire. This is especially important if you are cooking kidney beans (for more information on this, read here). Here is a method to use if you don’t have a slow cooker or want to do more prep work on the stove top. This is a straightforward and simple way to cook dried beans but it does involve a bit more vigilance watching the pot contents on the stove. Soak the quantity you want to use in a pot of cold water overnight (with plenty of water to cover the beans) or for at least 5 hours. The next day, discard this water and rinse the beans. Then fill up the pot with fresh water (enough to cover the beans by 2-3 inches of water) and cook the beans in boiling water for at least 30 minutes. Aim for a gentle consistent bubbling of the pot contents (without the contents overflowing the pot), adjusting the heat setting of your stove as needed. Cover the pot with a lid, leaving a small opening to let excess steam escape. After about 30 minutes, discard this first batch of cooking water. 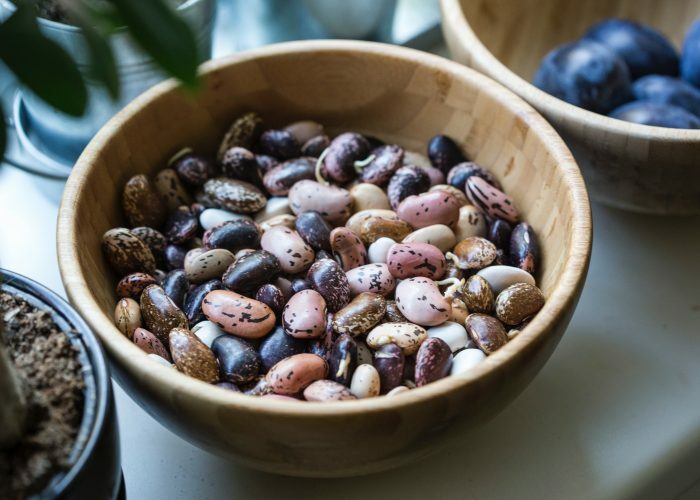 If you are planning to use these cooked beans in the slow cooker, simply throw the beans now in the slow cooker with the other ingredients to cook. If you are not using the slow cooker, see the next step. Fill up the pot again with fresh water (covering the beans with at least 2-3 inches of water on top). Now cook the beans again in boiling water for another 30 minutes to an hour, depending on your preference for how soft you would like your beans. If you plan to eat the cooked beans on their own (e.g., as part of a grain bowl or just as a side), you can add in an onion (cut in half) and 1-2 whole garlic cloves into this cooking water for more flavorful beans. However, this is completely optional and I don’t usually add in any onion, garlic or salt when cooking beans on the stove top because I plan to use the beans in other recipes later on (with the recipes’ own spices and seasonings). When the beans are cooked through (scoop some up in a spoon and blow on them gently to see if the skin peels back easily). You can taste a few too! If done, remove the beans from the pot to be used in your recipe. Don’t discard this second batch of cooking liquid as it can be used later on in recipes calling for vegetable broth. I like to use this leftover bean cooking water in making noodle soups, pasta sauces or in slow cooker recipes. This saves you time and money from having to buy commercial vegetable broth and enhances your recipes with more nutrition and flavor than using just water. The bean cooking water can keep in the fridge for a few days, so you can use it later in the week in a recipe, or you can also portion and freeze this extra cooking water to thaw and be used at a later date. This method is useful if you want to throw the beans into the slow cooker and let them cook, allowing you to get on with other things on your agenda. This method does take longer though (about 3-4 hours) so plan ahead if you want to use the beans for a dinner recipe in the evening. In general, most dry beans can be cooked using this method below. However, for safety reasons, especially for dry red kidney beans, I would recommend first boiling dried beans in a pot of water on the stove top for at least 30 minutes before cooking them further in the slow cooker. To find out why and read more about this, click here. If you have time, you can still soak the beans in a generous pot of cold water overnight (see method above) as this will make the overall cooking time faster, but if you don’t remember to do this, don’t worry. Fill up a pot with fresh water (enough to cover the beans by 2-3 inches of water) and cook the beans in boiling water for at least 30 minutes. Aim for a gentle consistent bubbling of the pot contents (without the contents overflowing the pot! ), adjusting the heat setting of your stove as needed. You can cover the pot with the lid if you like, leaving just a small opening to let excess steam escape. Replace the lid and turn the slow cooker on to a ‘low’ or ‘high’ setting (depending on how much time you have available) and let the beans cook for about 3-4 hours, or until the beans are cooked to a texture to your liking. To check, scoop some beans up with a spoon and gently blow on them to see if the skin peels back easily. Taste a couple of beans to check the texture and taste. When cooked through, turn the slow cooker off and remove the lid. Let the beans cool and remove some beans to use in your recipe. Discard the onion and garlic cloves (if used) in the slow cooker. Reserve the bean cooking liquid to use as vegetable broth in future recipes. What Should I Do With The Extra Beans? If you make a large quantity of cooked beans at once (which I recommend as it will save you lots of time and less washing up in the future! ), you can measure the extra cooked beans (drained of liquid) into cup or gram measurements and portion into lidded glass mason jars or freezer safe containers. Label, date and store these containers in your freezer. This makes it easy to take a jar out to thaw and use in your next plant-based recipe. And since you have already portioned it out, you know exactly how many jars to take out for your next cooking adventure. Happy bean-based cooking!